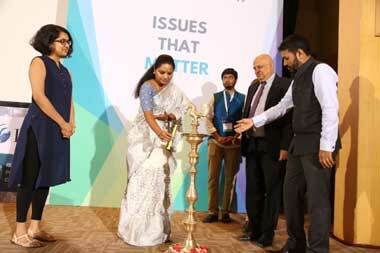 Hyderabad: Indian School of Business organised a daylong Policy Conclave on the theme “Road to 2019: Dialogue for Progress” here today. The objective of the conclave was to bring in different perspectives together discussing the issues of youth, which are to be addressed as part of the 2019 election manifestos of political parties. Prominent political leaders across party lines shared their thoughts on a range of topics covering – reservations, freedom of expressions, leveraging youth potential, politics and policy making; political reforms, urban-rural divide; leadership insights in public governance, among others. Speaking at the conclave, Smt. K Kavita, MP, Lok Sabha, TRS Party talked about the need to revisit reservation systems in India. “The State Governments in India must decide the reservation dynamics based on its demographic raw materials and must not be imposed by the Union Government”. While talking about women leadership in politics, she opined that unless it is made mandatory, women will find it difficult to get opportunities. Smt. Divya Spandana, Chairperson, Social Media, INC talked about the importance of freedom of expression and the growing importance of social media for political campaigning. She opined that social media offers a convenient pathway to put forth your views to a larger audience. “The women electorate in India can make or break 2019 elections”, she said. Shri Ram Madhav, National General Secretary, BJP said: “Nations are built on the foundations of the people and hence it is important to have certain systems in place that build values and tackle the problems of corruption. “Corruption has to be tackled from the top and values must be built from the bottom. Only then will India progress.” he said. Shri Feroze Varun Gandhi, MP, Lok Sabha, BJP, talking about electoral reforms he opined that it is important to work with the electorate and create mechanisms for a competitive policy reforms. Talking about salaries to politicians, he opined that it is waste of resources to increase salaries of Members of Parliament. Other speakers during the daylong conclave were: Shri K Vishweshwar Reddy, MP, INC; Shri K Balasubrahmanyam, Secretary, BJP; Dr Vijay Sahasrabuddhe, National Vice President, BJP; Shri P V Midhun Reddy, MP, YSRCP; Shri Ashwani Lohani, CMD, Air India and Shri Naga Sravan Kilaru, National Youth Awardee.